This two-day workshop invites you to look afresh at the indoor garden as the subject for a large-scale work in either oil or acrylic paints. The studio set-up will emulate an outdoor environment with a collection of plants of varying species and dimensions, with vibrant colour and natural forms to inspire you. The workshop is designed to guide you through the complete process of making a still life painting using highly successful, professional techniques. It begins with an introduction to still life painting. 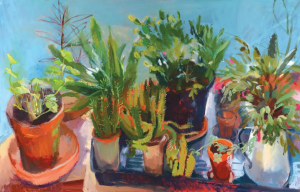 You will also look at the work of artists who have used indoor plants as a motif in their work including Winifred Nicholson, Elizabeth Blackadder and Matisse. You will be taken through the main stages of making a finished painting from generating initial ideas to developing a strong composition and finally, taking your ideas to a conclusion. Expect to work in bold colour with simplified forms. With plenty of demonstrations and one-to-one tuition, you will have the opportunity to explore new ways of looking to help you discover your creative potential. Kim is a highly experienced art tutor and practising artist. During 10 years of teaching, she has taught art students of all ages and abilities at various institutions including The Royal Drawing School, Central Saint Martins, City Lit, the Prince’s Foundation and workshops with adults and secondary school students across London. She has also been the recipient of several awards and residencies and has exhibited her work widely including the BP Portrait Award, the Royal Society of Portrait Painters and the ING Discerning Eye Exhibition.